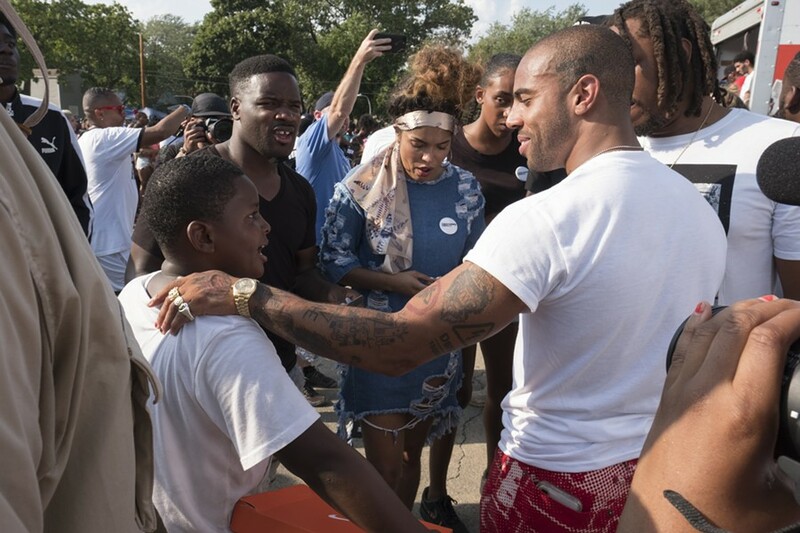 Vic Mensa helped give away 15,000 free shoes in Englewood on Sunday. 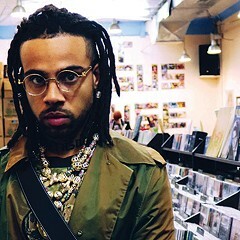 The timing of Vic Mensa's high-profile response this past weekend to a Chicago police sting operation was more than a little serendipitous. Remnants of the old Black Panther Party gathered in Oakland on the same weekend of the young rapper's "anti-bait truck" event to mourn the recent death of Elbert "Big Man" Howard, one of the organization's founders. This week also marked the 50th anniversary of Bobby Seale's arrest in Chicago for his role in planning the anti-war protests outside the 1968 Democratic National Convention. On Sunday, the 25-year-old Mensa looked ready to assume the Black Panther mantle—and not just because he's got one tattooed on his shoulder accompanied by the words "Free Huey." Among the many organizations and individuals involved in the giveaway were the New Black Panther Party of Chicago and Fred Hampton Jr., the son of slain Panthers leader Fred Hampton. And over the course of a 15-minute conversation inside a scorching-hot room at the West Englewood Community Center, Mensa quoted Angela Davis and Mao Zedong and dropped the name of Huey Newton. When asked what role he might personally play in police reform in Chicago, he said, "At the end of the day, what we're doing right here is an extension of what we learned from the Black Panther Party, to police the police." To those unfamiliar with Mensa's past work and activism, that might sound like an appropriation of the past for the sake of street cred. It could come off as bold bluster coming from the mouth of an artist famous for incendiary songs like "16 Shots," a track in which the Hyde Park native furiously spits rhymes about his outrage over the shooting death of Laquan McDonald by a Chicago police officer. But the anti-bait truck event was further proof that Mensa's radicalism is much more than rhetorical. Organizers estimated that a crowd of between 20,000 and 30,000—larger than the size of the one that saw Mensa onstage at Riot Fest in Douglas Park last year—stood for hours in a line that snaked around blocks in Englewood to get a free pair of shoes. 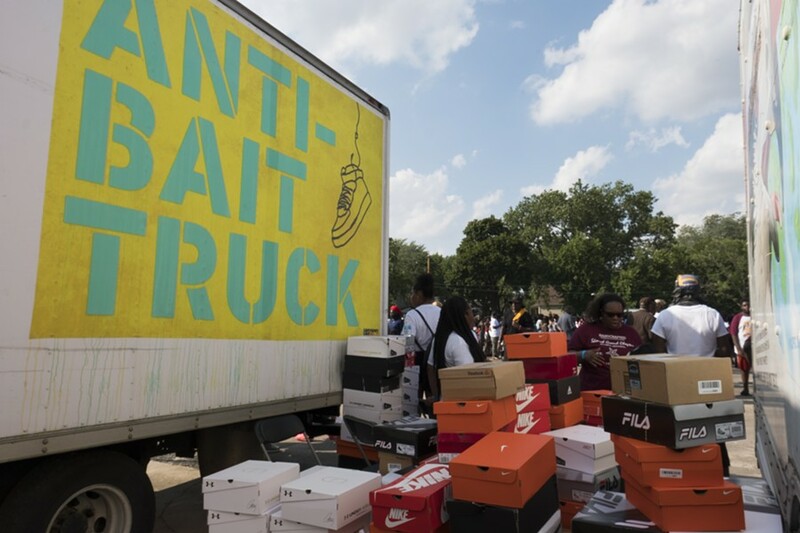 Then Mensa, members of his nonprofit Save Money Save Life, and a host of other volunteers handed out 15,000 pairs of sneakers along with food and a smattering of free haircuts. It was all sparked by community activist Charles Mckenzie's video posted on social media earlier this month. Mckenzie says he stopped driving and starting filming when he realized that someone had set up an unmarked, apparently unguarded "bait truck" stuffed with expensive Nikes near a basketball court, then saw Chicago police officers arresting those who were taking the shoes. "I couldn't believe my eyes," Mckenzie says. "Why would you put up a bait truck in the ghetto where people don't have anything?" Mckenzie's video went viral and struck a nerve with many people of color on the south and west sides. Mensa was equally outraged when he saw the bait-truck footage on Instagram. The rapper says the sting represented yet another instance of racism on the part of a police department with a "long history of racist, violent incidents against black people. "We're living without resources over here, and much of the community is beneath the poverty line, and you're pulling up a truck with basketball shoes next to where poor kids are playing basketball?" he says. "It's like they want it to seem like black people are inherently criminal." The Chicago Police Department has distanced itself from the sting, which a spokesman said was planned by Norfolk Southern Railroad rather than the CPD. Police superintendent Eddie Johnson says the department is taking "a hard look" at the practice, and Norfolk Southern later apologized for has been called Operation Trailer Trap. Charges have been dropped against the three men arrested during the sting. But merely preventing the next bait-truck operation isn't enough, says Mensa. The entire department needs structural reform. "Will we not progress at all in our ability to hold these people accountable? These are murderers, they're violent criminals, that's what we need to call them. They are hiding behind a gun and a badge," he says. "If you look [it] up, police officers have like the highest rates of domestic violence because they are violent people. You give somebody that power and that unquestionable power and you think it's not going to mess with their psyche and make them feel larger than life? "And so Huey Newton, before they changed the laws in Cali, would just stand there with a rifle when the police would pull over a black person and start harassing them. He'd just let them know, 'We watching you.'" says Mensa. "So now we've got Charles Mckinzie, except now he doesn't need a rifle. All he needs is a phone. The whole world can see what's going on." 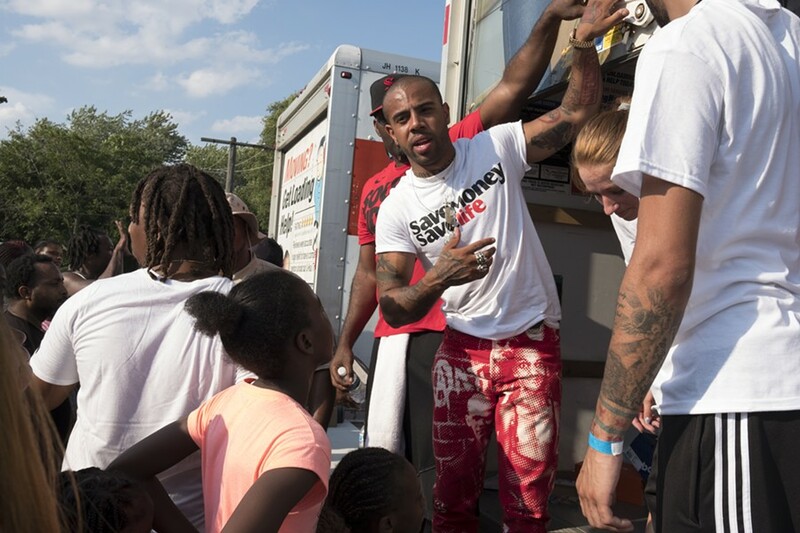 Mensa believes the underserved communities in Chicago need to begin organizing and helping themselves, part of his motivation behind the anti-bait-truck event. "If they want to send the message that this community is not valued, then it's up to us to counteract that with love, abundance, peace, and resources for kids in a low-income area," he says. "We need positive and constructive resources being put into the community." 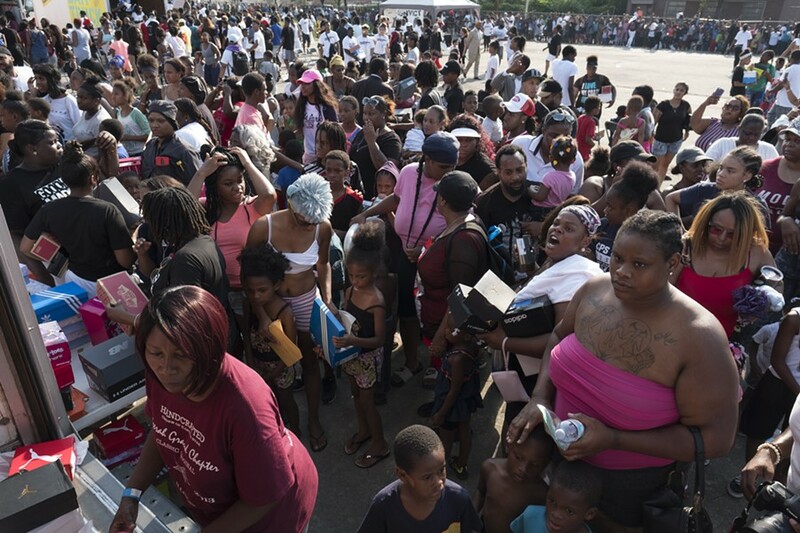 An estimated 20,000 to 30,000 people attended the "anti-bait truck" giveaway. 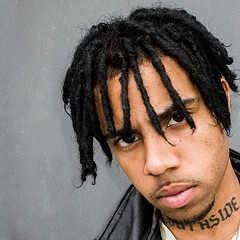 In March, the rapper launched Save Money Save Life to try to do exactly that. The foundation aims to train first responders for underserved neighborhoods and send mental health therapists into disadvantaged CPS schools, and it's establishing an education program to mentor black and Native American youth. Street Medics, as the first-responder training is called, was inspired by Mensa's trip to Gaza earlier this year. His outreach to indigenous people comes two years after he traveled to North Dakota to support the Standing Rock Sioux's action against the construction of the Dakota Access Pipeline. It's no coincidence that Mensa is intent on building solidarity between different groups of marginalized people. 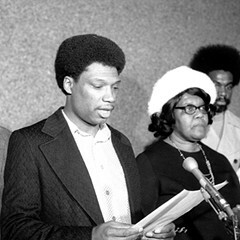 The Panthers also honored Malcolm X's belief in seeking working-class unity across gender, color, and boundary lines. "All of our efforts have to be global," says Mensa. "We have to recognize that if they come for you in the night, they'll come for me in the morning." Save Money Save Life is reminiscent of the kind of community service programs—termed "survival programs"—that the Black Panthers developed in the late 60s and early 70s. 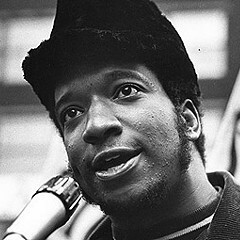 After Fred Hampton founded the Panthers' Chicago chapter in 1968, it almost immediately started free breakfast programs for schoolchildren, established a medical center that didn't charge patients for care, and instigated a project encouraging community supervision of the police. The philosophy behind the programs was one of self-organized socialism. Since black people had been starved of resources and assistance from the state, the Panthers began to develop their own communal institutions in poor black neighborhoods. Their leaders also believed that programs like Breakfast for Children educated people in the ways of Marxism through practical experience. People may say they hate socialism in theory, said Hampton, but once they try socialistic programs, they learn to love it. "A lot of people think [Breakfast for Children] is charity, but what does it do? It takes the people from a stage to another stage. Any program that's revolutionary is an advancing program," Hampton said in a speech at Olivet Baptist Church in 1969. "Revolution is change. Honey, if you just keep on changing, before you know it, in fact, not even knowing what socialism is . . . they're endorsing it, they're participating in it, and they're supporting socialism." On Sunday, Mensa didn't cite anti-capitalistic politics as his motivation. He tried to avoid talking politics at all—well, electoral politics at least. After he criticized Chicago's police oversight boards ("In the past, the IPRA was not independent at all, it was full of former cops or people who had police in their families"), I asked if he might try to fix CPD from the inside. Would Mensa try to serve on the IPRA or run for mayor in 2019? He answered with a line from Chairman Mao, the Chinese revolutionary whose Little Red Book of quotations was once required reading by the Panthers. "I am political because politics is war without bloodshed," Mensa said with a pained expression on his face. "But I would never be a politician because I can't, I can't. I can't lie like that. I can't lie through my teeth, it's too important to me. The things I believe are too important to me to compromise. Even the politicians that people idolize like Barack Obama, he still had all these drone strikes that he was signing off on and more deportations than any other president. I couldn't be a politician, that's not for me. "I'm a revolutionary, not a politician."